the world's most popular flavor! Are you a chocolate fan? Then you will want to put these Chocolate Biscotti Recipes on your "must try" list. 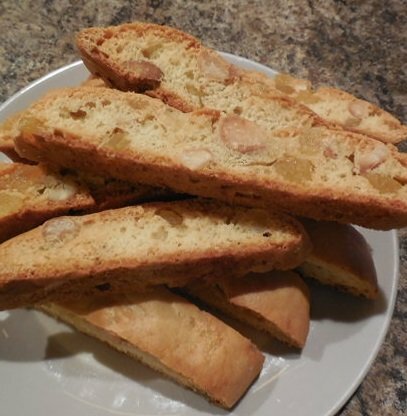 But, before you start you might want to review Making Biscotti. Maybe, you would like to learn more about the star ingredient........ Chocolate........well read on. As an ingredient, chocolate, in the making of biscotti can take one of three forms or a combination of two or all three for the ultimate chocolate biscotti recipe. Chocolate dough recipes are made by adding cocoa to the dough. If you want to make the best chocolate dough then you need to use the best cocoa powder you can aford. You can use natural or Dutch-process, whichever you prefer. Just remember that the chocolate flavor of the finished biscotti is dependent on the quality of cocoa powder you use. So it’s worth using a decent one. I use Valrhona when I bake the best! Chocolate filled recipes, chocolate chip, chocolate chunk, chocolate whatever. Just remember the quality of chocolate you use will determine how good your chocolate filled biscotti will taste. Not all Chocolates are created equal, and in general, there is a strong correlation between quality and price. This is not to say that you should always buy the most expensive chocolate, but be aware that high-quality chocolates with large amounts of cocoa butter and cocoa solids will cost more than their inferior counter parts. 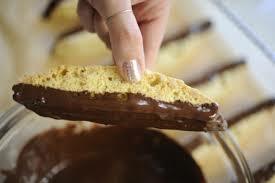 Chocolate dipped recipes require melting chocolate so that finished and cooled biscotti can be dipped. the recipes here combine the best. The quality of chocolate applies this category too. 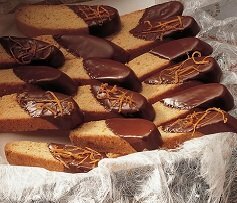 Well if you are ready to bake then go to the Chocolate Biscotti Recipe Collection . Melting chocolate can be accomplished in a microwave or over a hot-water bath. Use block or bar form chocolate, not chocolate chips. Chips have additives help them retain their shape at higher temperatures. Chopped into uniform pieces to ensure even melting. Never try to melt large bars or blocks. Avoid all contact with water! Chocolate will seize and become unworkable. Make sure your bowls, workstation, and spatulas are completely dry. Melt the chocolate slowly over low heat, it can become lumpy or grainy if overheated. Stir the chocolate frequently with a rubber spatula, once the outer edges start to melt. Chocolate retains its shape when melted, so the only way to know if it is truly melted is to stir it. Do not rely on appearances alone. A word about White Chocolate. It is not actually chocolate,it gets its name from the cocoa butter it contains, but does not contain chocolate liquor or any other cocoa products. As a result, it has no pronounced chocolate taste, but commonly tastes like vanilla or other added flavorings. But who really cares? It still tastes good! And is a star ingredient in some of our Biscotti Recipes. For a more detailed discussion of chocolate and the methods, Click Here. …. On to the best ever chocolate biscotti recipes. So, go ahead and pour yourself a cup of coffee, your favorite tea or glass of wine, sit back, get comfortable, and enjoy browsing through this collection of Biscotti Recipes made with chocolate. 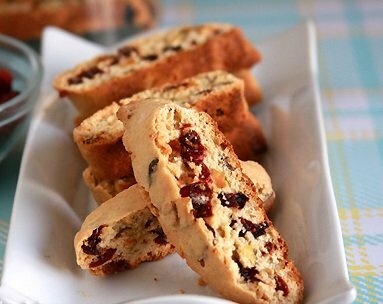 You'll have fun trying and sharing these best ever biscotti recipes with family and friends and soon everyone will be amazed at your biscotti baking skills.